Though I can be pretty minimalistic when it comes to building my everyday makeup look, one product that I seem to use almost every day is luminizer, which the Kim from several years ago would have written off as a frivolous, unnecessary product. Boy was that Kim wrong. Luminizers help attract and reflect light from your skin, giving it a radiance that helps you appear more awake and glowing — traits that this night owl loves to see come to life on much-too-early Monday mornings. 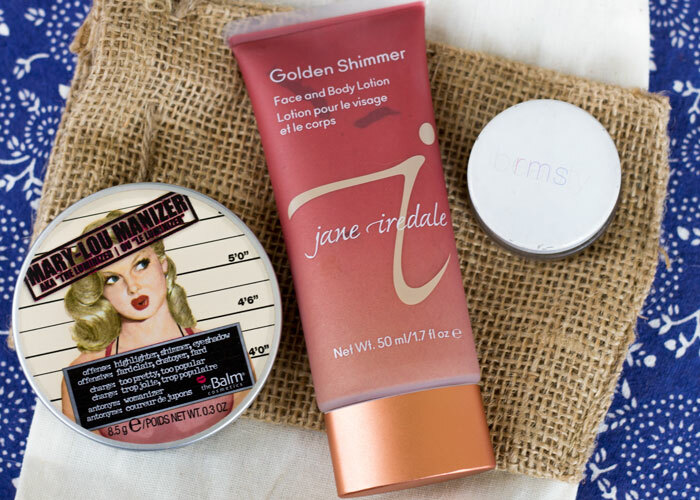 These three luminizers are my go-to products for bringing back a little life to my skin. Which ones have you tried? So, The Balm isn’t exactly a green / clean brand, but its Mary-Lou Manizer highlighting powder scores a “1” on the EWG Skin Deep Database and does a wonderful job of delivering a brightening sheen to my temples and undereye area. I like to sweep this onto my skin using my Real Techniques Setting Brush, which is the perfect size for applying a small amount of luminzer (you don’t need much!). The Balm’s “Mary-Lou Manizer” is definitely my go-to, everyday luminizer because on most days, I use a mineral powder foundation and mineral powder blush and can blend this a lot easier. New this season, Jane Iredale’s Golden Shimmer Face and Body Lotion is a gorgeous peachy-shimmer liquid that can easily be mixed in with your daily SPF and/or liquid foundation for a hint of glow and flush of color. I love that this luminizer is made for face and body and applies like a lotion; I use it on my chest and shoulders when I’m going out for the night and baring some extra skin. I also like to massage it into my forearms for an additional shimmer that picks up the moonlight. For daytime, I stick to using it on my face mixed in with my liquid foundation, and I go very easy on it (you need maybe 1/4 of the squiggle I photographed above). Sometimes I’m a bit more deliberate about where I apply it — think temples and cheeks — if I don’t want an all-over shimmer. This is definitely a fun one to experiment with this summer! Easily the most famous luminizer in the green beauty world, RMS Beauty’s Living Luminizer has been in my makeup kit for more than a year, but I must say, it’s taken me a loooooong time to develop warm feelings for it. As an oily-skinned gal, I struggled with getting this ultra-wet, coconut oil-based luminizer to stay put and not look greasy. I’ve learned to dab it on using my ring finger and only pat it in where I absolutely want some shine, or else risk appearing slick instead of sleek. I tend to stick to keeping RMS Beauty’s Living Luminizer near my undereyes and tops of the apples of the cheeks, but sometimes I get adventurous and add it to my Cupid’s bow and even dab it into the middle of my bottom lip to add some dimension and fullness to my kisser. So, these are the top three luminizers in my makeup kit, and I rotate all of them in and out of my routine. However, if I had to choose just one (no beauty blogger ever has to choose just one, though! ), I’d say that my favorite is The Balm’s Mary-Lou Manizer. I’m just kind of partial to powders. What are your favorite luminizers? Have you tried any of my top three favorites? Tell me in the comments section below!